Antique light fixtures, a salvaged fireplace, and a striking wall-to-wall bookcase create an urban vibe in the revamped condo’s combined library, office, and living space. Imagine traveling back to the mid-20th century and walking down the choppy, uneven sidewalks in the Stevens Square neighborhood of south Minneapolis: To your left, Abbott Hospital stands tall on the northeast corner of 18th Street and First Avenue South. You stride by a glorious, three-story brownstone on your right and can’t help but tilt your chin to the sky for a better look. Down the block, the community park is buzzing with diverse young families, and off in the distance, you overhear middle-income residents anxiously discuss plans for a new freeway that would flatten their neighborhood (the place they called home) to the ground. In 2019, we know the same freeway as 35W, and we also know Stevens Square has remained securely intact. Over the years, the neighborhood has shuttled in nearly four thousand residents (then and now, it’s been coined as one of the smallest and densest areas in the metro) and has the same distinctive charm as it did the century before. It’s still diverse, still affordable, and still home to dozens of unique, yet cohesive, historic brownstones. 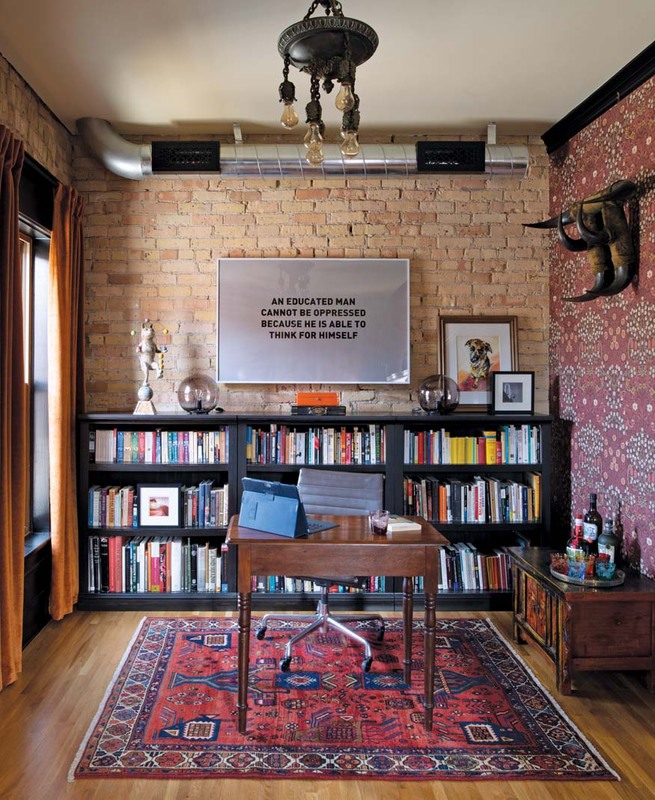 Minnesota native Seth Goodspeed—an art-loving dog dad and director of alumni relations at the Minneapolis College of Art and Design—is the proud owner of the condominium you see here, tucked inside his shared 1899 brownstone beauty. In 2011, he fell in love with the undying potential of the foreclosed condo, and within one month, keys were in hand. Though head-over-heels with the neighborhood and location, his enthusiasm for the interior didn’t match. The brick exterior is tried and true, but a devastating top-to-bottom gut in 1979 stripped away most of the traditional woodwork, floor plan, and character inside. The dream for a historically accurate aesthetic mulled in Goodspeed’s mind for nearly five years, until finally, in the spring of 2016, he made a call to David Heide—a nationally recognized interior designer and architect in Minneapolis. 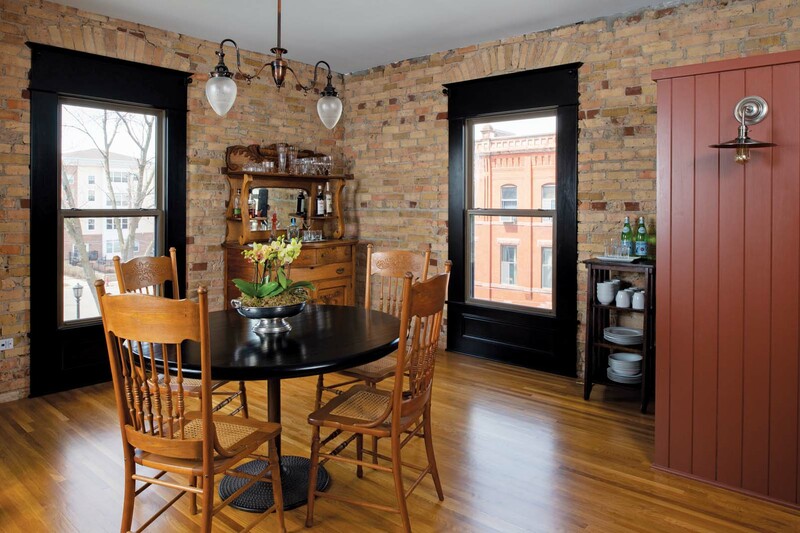 Throughout the condo, warm hues offset exposed brick walls to create a calming atmosphere. Originally, Goodspeed’s must-haves were confined to simple cosmetic changes—things like new doors, updated window trim, and baseboards—but Heide had other plans. 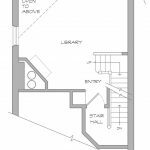 He proposed another full remodel to make the space look not only more authentic, but more livable as well. Goodspeed owns the entire third floor, but only the northern half of the second. 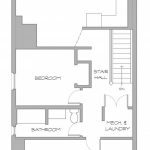 Awkward in itself, the floor plan, unsurprisingly, left half the home unused. Meager air circulation made areas cold and uncomfortable. Storage space was slim to none. These problems led to supply ducts, small closets, ceiling textures, and a loft on the third floor (which oddly overlooked the corner of the living room on the second floor) being hastily removed. Exposed brick walls and ventilation speak to the space’s storied history. 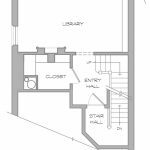 But now, after building out a new, more efficient design, the “first” floor of Goodspeed’s condo has a much-needed storage closet and combined library, office, and living space. 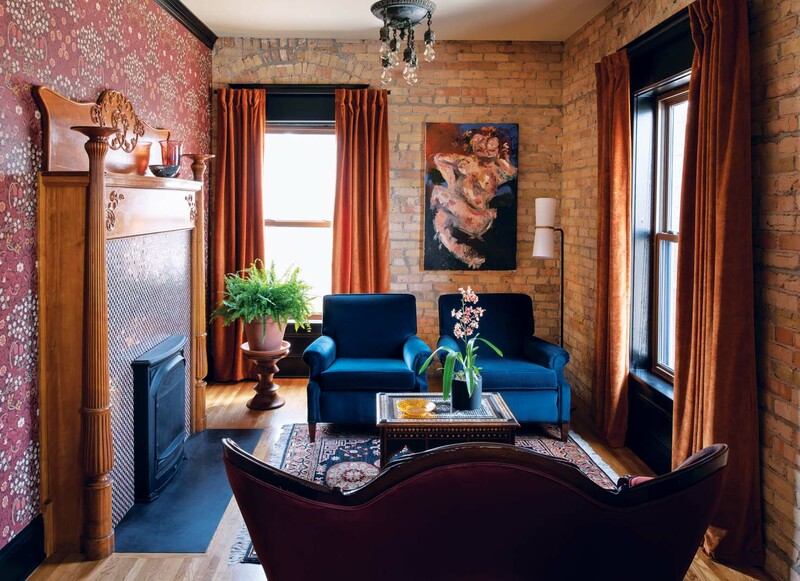 The revamped room (decked out in flowery William Morris wallpaper, navy velvet, and burnt orange tones) features a salvaged fireplace, exposed ventilation, antique light fixtures, and custom, edgy art that adorn the walls and dress up the wall-to-wall bookcase. 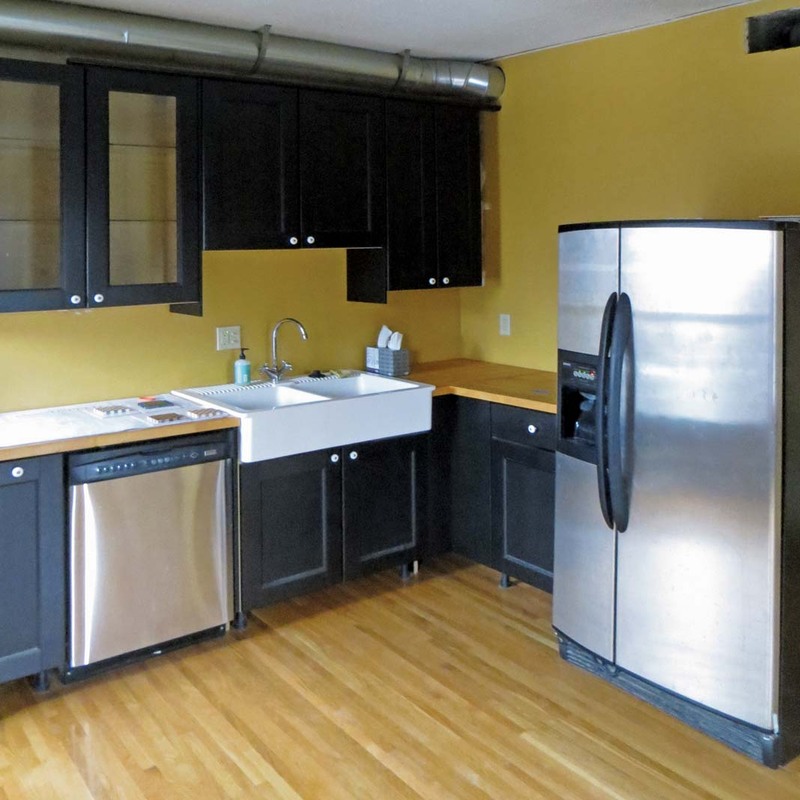 A hallway-turned-art-gallery leads to the newly remodeled kitchen. Around the corner, a staircase (the only original feature left in the home) climbs to the third floor and drops you off in a hallway-turned-gallery—complete with art from the homeowner’s impressive collection. 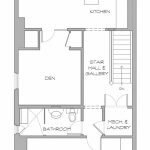 The top floor of the building is rounded out with the kitchen, dining area, two bedrooms, and bathroom. Even though it wasn’t originally on Goodspeed’s radar, the bathroom is one of his favorite transformations. The showstopper (a towering white-gray Carrara marble slab that serves as part of the shower wall) in combination with chrome fixtures, stark white tile, and light blue walls creates a tranquil, ethereal atmosphere. Down the hall and through the gallery is a modern kitchen and dining space—blessed with a million-dollar view of the Minneapolis skyline, a gorgeous, aged-brick wall, and a bar. 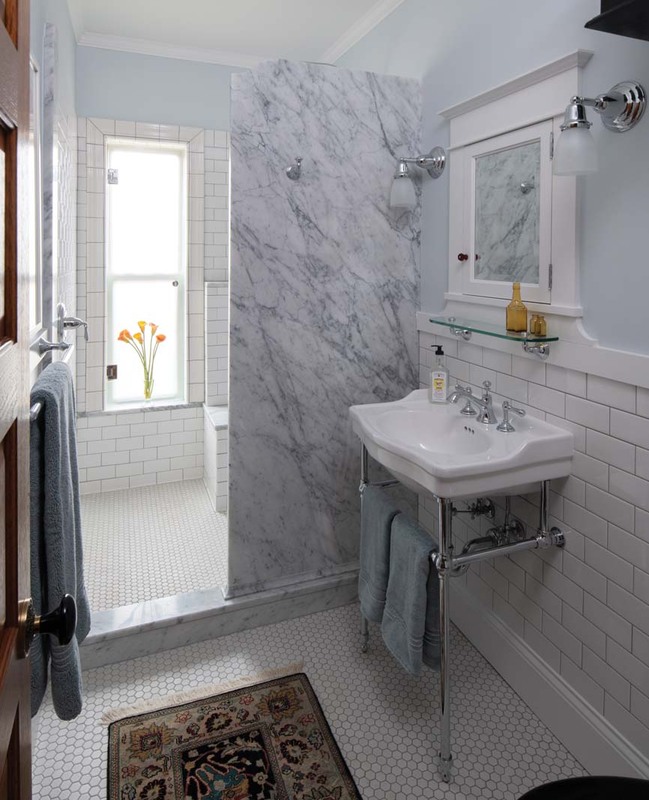 A Carrara marble slab makes a statement in the upper-floor bathroom. And that it did. What originated as an under-utilized, historically “off” condominium is now a home that (yet again) does the neighborhood justice—and then some. 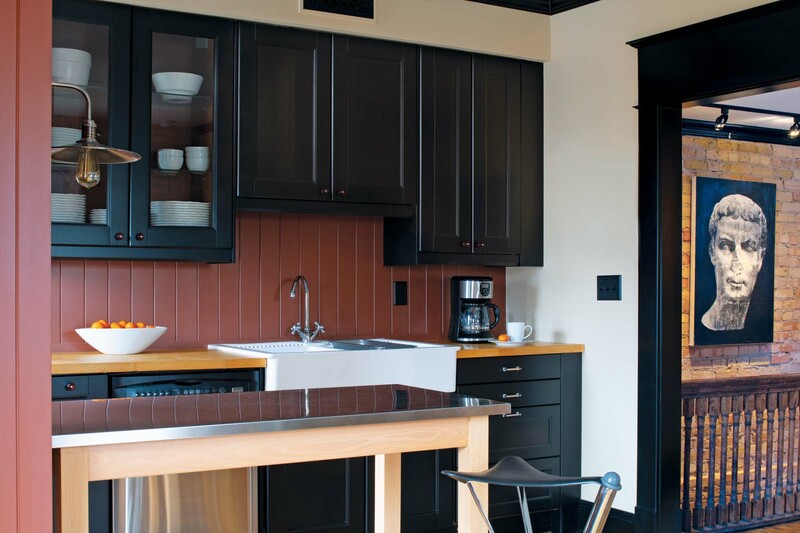 The kitchen’s black cabinets coordinate with thick black window frames found in the adjoining dining space. Katelyn Bloomquist is a Minneapolis-based freelance writer.